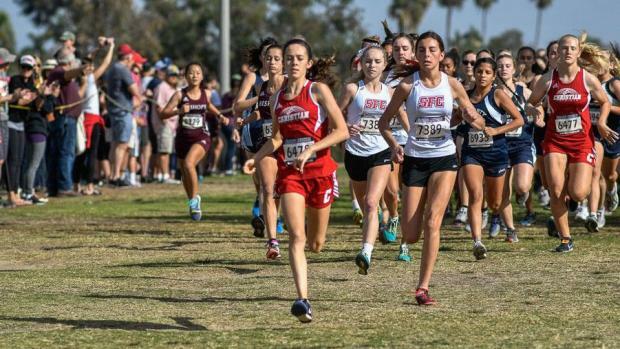 SAN DIEGO -- Some considered it nothing ore than a warmup for the state championships while others celebrated their victories in the San Diego Section Championships contested over the 2.96-mile course at Balboa Park's Morley Field. Unsung Jonathan Velasco of Mission Hills not only captured his first title, he ran the fastest time of the day, clocking a 15:05.1 to beat Otay Ranch's Justin Mulvany by 19 seconds. Not bad for someone who finished eighth in the finals a year ago at 15:47.6, not even qualifying for the state championships. "I'm so excited," said Velasco. "I knew when I crossed the finish line I was going to state. I wasn't nervous at the start, but I held back until coach told me to go. At the end I had nothing left." Velasco said after missing his second straight state meet a year ago, he incorporated cross-training, swimming, biking and weight-lifting. Oceanside El Camino won the wide-open team race, low-scoring San Marcos, 103-131. Jacob Stanford, as he has done all year, led the way at 15:06.0 and was quickly followed by his twin brother Garrett (15:08.7) and Caleb Niednagel (15:13.6). One of the state's better runners, San Pasqual's Franky Varela was relegated to fourth at 15:19.4. "It was way more fun finishing1-2-3 than winning the individual title," said Jacob, who, like his brother, will attend BYU next year. "The pace was way too slow so at the first big hill I made a move to string out the pack. It worked and in my mind I thought the race was over, but there was still two miles to go. That was a long last two miles. "We haven't been allowed to say the "S" word but now we can say it-we're going to state." Garrett was equally pleased because he was right back where he was before a foot injury a month ago slowed his progress. "I want to think I'm one of the better runners-I just race the best I can," he said. "The cloud that was over me is gone." Lakeside El Capitan's Matt Machnov didn't like the way things were going early in the race, so he decided to take control and he pulled away to win by 12 seconds over junior teammate Andrew Sager at 15:43.4. The Vaqueros easily topped Cathedral Catholic for the team title, 39-70. "At the 800-meter mark we were going way too slow," said the senior. "Going in I felt really confident after having a really solid race against Grossmont. That helped me mentally. Last year they changed the course and took out the second big hill. I like hills so I was really disappointed." Machnov has only lost a small handful of races this season and he blames that on losing focus. He had no trouble focusing Saturday after he took the lead and could not be challenged, even by Segar who handed him one of his setbacks this season. Defending champion Nader Ali was the prohibitive favorite, so when Sage Creek's Justin Morris pared a 12 second lead to less than 10 with a mile to go, some thought Ali might be in trouble. It didn't happen as Ali overcame a difficult week to pull away and win by 14 seconds over Sage Creek's Daniel Rubin. "On Monday I had some blood taken -- eight vials," said Ali. "After about seven I started feeling weird. I couldn't run, not even on Thursday -- I was just feeling weak. Really, really weak. I love taking it out and that wasn't going to change, and I believe in myself. "I just wasn't sure how I would do today, missing all that practice." Sage Creek used its superior depth to edge Crawford for the team title, 53-61. There wasn't anyone who was a more disappointed champion than Maranatha Christian junior Riley Burns. After winning his race in 16:06 a year ago, he crossed the finish line first in 16:13.3. "I didn't do well," said Burns immediately after winning by 32 seconds in a less than competitive race. "I wanted to run faster, my body just wouldn't cooperate. The first mile was way too slow so at the top of the hill I decided to take it out. I wanted to move at the hill and the 2-mile. "Defending my title was nice but next year I'm going to run much faster." As time passed, Burns mellowed a bit, taking it a little easier on himself. "I'm not satisfied with my performance, but I am happy to win," he said. "The race this year was the exact opposite of last year when I made a move at two miles and ran better. At least I have state." Francis Parker edged Santa Fe Christian, 59-71 for the team championship. This has been a big year for Canyon Crest junior Carlie Dorostkar who dominated Saturday's race from beginning to end, winning in the second fastest time of the day -- 17:19.4. She was victorious by 52 seconds over Rancho Bernardo freshman Jacey Farmer (18:11.8) and Bronco sophomore Ashley Learn (18:14.0). "I never hope for a time, here it's more about your place," said Dorostkar, who improved almost a minute over last year's fourth place finish. "A lot of people were shouting out that I was leading by 40 or 50 meters but I don't listen to them. "I like to relax when I'm racing. For me it's about being in the moment on race day. When I think of where I've come from last year, this is a milestone." Rancho Bernardo surprised Oceanside El Camino in the team race, 65-70. The day's most anticipated race certainly lived up to its billing. La Costa Canyon's Kristin Fahy not only won her third straight title, she was the only runner to break 17 minutes after saying midweek that she was going to train through and not go for any time. 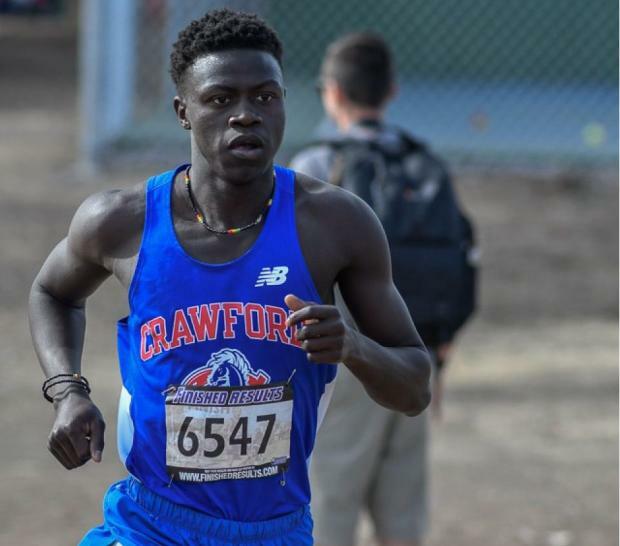 "I still wasn't concerned about my time until I crested the final hill and saw the clock," said the Stanford-bound senior. "I knew I could break 17 if I hurried and since it was my last meet at this distance here, I went for it." She ran 16:57.5, as the Mavericks had their best team race of the season with Jessica Riedman (17:51.6), freshman Kyra Compton (18:24.6) and sophomore Sydney Weaber (18:27.5) following Fahy across the finish line. LCC won the team title with just 23 points. "Dang, that's awesome," said Fahy when she reran her race in her mind. "Finishing 1-2-3-4 was way more impressive than winning my third straight. In fact, my first win was the one that meant the most to me because it was such a good field. That's when I realized I had potential as a runner." Probably the most under-rated runner in the section this year has been Mission Vista's Bella Longo. No more, after she delivered her school its first cross country crown, winning by 52 seconds in 17:48.4. Although she was happy with the victory, the sophomore said she wished La Costa Canyon was still in the division to push her to an even faster time. "Having Kristin (Fahy) in the race is inspiring to me," said Longo. "Last year it was all new to me. I ran track in middle school but not cross country like this. I love it. You can just leave your home and go on a training run whenever you want. "In the races I get into my zone and everything else is fuzzy. I don't hear anything. I just decided to go right to the front so I wouldn't have to fight anyone." El Capitan (68 points) topped University City (77) and Cathedral Catholic (81) for the title. One of those athletes who were just counting the meet as a training run was Sage Creek junior Skyler Wallace who nonetheless beat her freshman sister Stormy to the finish line by 30 seconds in 17:23.2. The Bobcats won the team crown with 30 points. "My goal was to win and get the best result possible," said the junior. "I knew (Coronado's) Teresa Perez probably had the best kick in the section, so I pushed hard early. But this meet was just a building block for state. "My attitude was to go out hard and 'catch me if you can' "
Not so her sister who was running in her first section championship. "I didn't know the course so I basically stuck with my sister the whole way," said Stormy. "My coach told me the course was like a lollipop so I just watched Skyler." There was no stopping defending champion Alaina Zamorano of El Cajon Christian. Not even hamstring concerns. "My hamstrings have been bothering me for a week and a half," said Zamorano, who ran comfortably to win in 18:37.9-24 seconds slower than a year ago. "They were tight the whole time. I try ice, I stretch and I roll them out. "It's kind of scary. We ran in the heat of the day today after being the first race in the morning a year ago. The course, especially the dog loop, was very soft. I remember warming up in my sweats-not this year." Christian's team is down to three girls so they had no chance for a team title that was owned by Santa Fe Christian which went 2-4-5-8-9 for the low score of the day-19 points.